I have a rather complicated history with detective stories. When I was 11, I scared myself silly by forgetting I’d put a pillow in my bed to confuse my sister while I was downstairs watching Joan Hickson’s Miss Marple with my parents. Once I’d seen Miss Marple on the TV, I promptly read all the Agatha Christie books that my mum owned, bought more with my pocket money and then in a fit of angst over death (in particular my own), gave all my purchases to the jumble sale and hid mum’s copies out of sight. I know. I was a strange child. After that, I left detective stories alone for probably about five years. Then a friendly librarian, who found out that I was a bellringer, pointed me in the direction of The Nine Tailors, which I duly read, enjoyed and then forgot about – although by this point I had started reading Agatha Christie again. Fast forward nearly 10 years and I’m living in Essex, working the early shift at a radio station, a bit lonely and hitting the library hard. I don’t know if I started reading them because I was reading Margery Allingham (who had lived locally) and seen comments that Albert Campion had started as a take-off of Peter Wimsey, or because I’d seen a recommendation, or because I happened across them in the stacks at the library and remembered I’d enjoyed The Nine Tailors, but I did rediscover them and boy did I love them. My little local library didn’t have many books in the series – and once I’ve found something I like, I want to read them all, as quickly as possible. So I started buying them in the local book shop. But it didn’t have many in stock. So I picked up a few second hand paperbacks from my friendly book dealer who happens to do detective stories as well as classic school stories, then I started buying the ones that I’d read at the library (because I *had* to have the whole set) and so my rag tag collection was born. 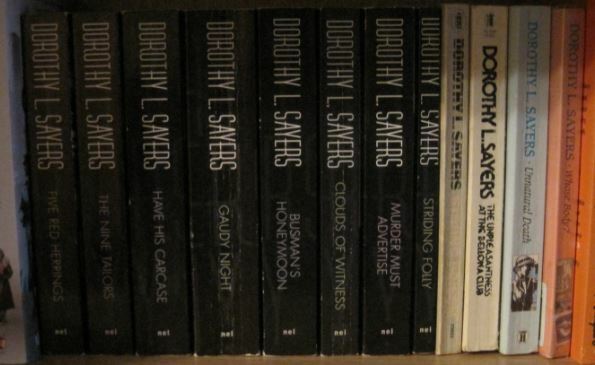 For those who have had the misfortune to have never come across Lord Peter Wimsey, he is the archetypal gentleman detective – much copied and never equalled. The second son of the Duke of Denver, born in 1890, educated at Eton and Oxford, he is a bon vivant with a private income who solves mysteries because he can. But Peter is troubled – he’s battle scarred after the First World War, with shell-shock and a fear of responsibility; which sits badly with sending men to the gallows. He’s much more than just an idle rich man with a vaguely foolish face – which is the image he likes to project to the world. Assistance comes principally from his faithful valet Bunter (who had been in his unit in France) and Chief Inspector Charles Parker of Scotland Yard. The books were published between 1923 and 1937 – and Peter ages in real time as the series progresses. 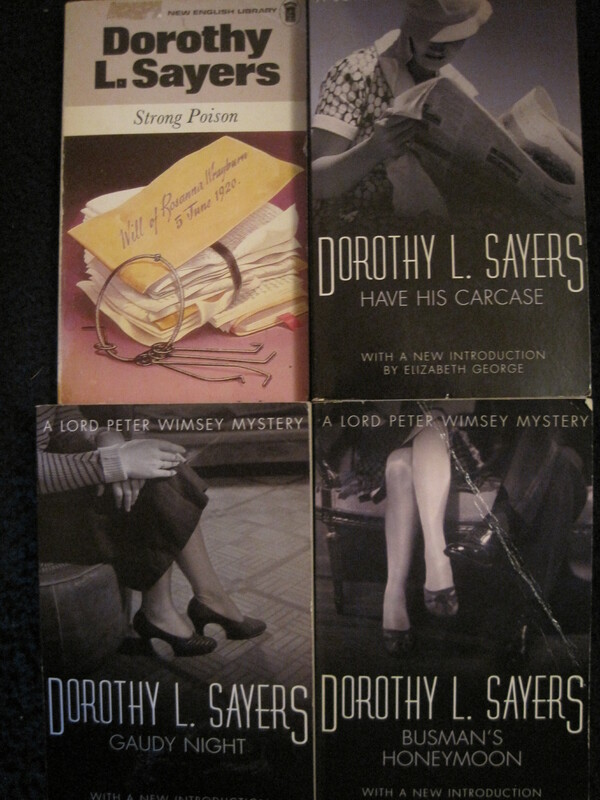 My favourite four books are what I call the Peter and Harriet Quartet – that is Strong Poison, Have His Carcase, Gaudy Night and Busman’s Honeymoon – the novels that feature Harriet Vane, first encountered in the dock at the Old Bailey on trial for murder – who Peter falls in love with and pursues across the next three books. As well as my paperback copies, I have all four as audiobooks or radio plays – and they run in high rotation on my generic mp3 device on my journeys on the train, on my lunchbreaks and late at night when I’m staying away from home and need something to listen to to get to sleep. I didn’t read them in order – Have His Carcase came first, then Busman’s Honeymoon, Strong Poison and finally Gaudy Night. It has been said, by myself and others, that a love-interest is only an intrusion upon a detective story. But to the characters involved, the detective-interest might well seem an irritating intrusion upon their love-story. This book deals with such a situation. And to me, that pretty much sums it up perfectly. Busman’s Honeymoon is a perfectly formed detective novel (I didn’t figure out who did it until the reveal) but also is a beautifully romantic story about the start of a couple’s married life. And if you’ve read the three books that lead up to it, it’s the perfect end to a long and sometimes painful courtship, which must have felt tortuous to readers when the books were first published – because Strong Poison was appeared in 1931 – and Busman’s Honeymoon came out six books later in 1937. Gaudy Night is the weakest of the four when it comes to the detective plot – it’s not an actual murder but a poison pen mystery and actually has very little Peter to a lot of Harriet. But it’s still a very good book and you learn a lot more about Harriet, her life, her side of the courtship and what she was doing while Peter was solving the mysteries in the two novels of that part of the series that she doesn’t feature in. Strong Poison and Have His Carcase have two of Sayers’ best puzzles – they’re utterly ingenious and perfectly plotted. Among the other novels, my favourite is Murder Must Advertise, where Peter – under the psedonym of Death Bredon – goes to work at an advertising agency where one of the copywriters has fallen to his death, leaving a letter hinting at scandalous goings on in the firm. Sayers was herself a copywriter for a decade – and the book is a fascinating glimpse into the world of advertising in the early ’30s as well as a really very clever murder mystery. I could write at even greater length about the wonders of these novels, but this post is already massively long. 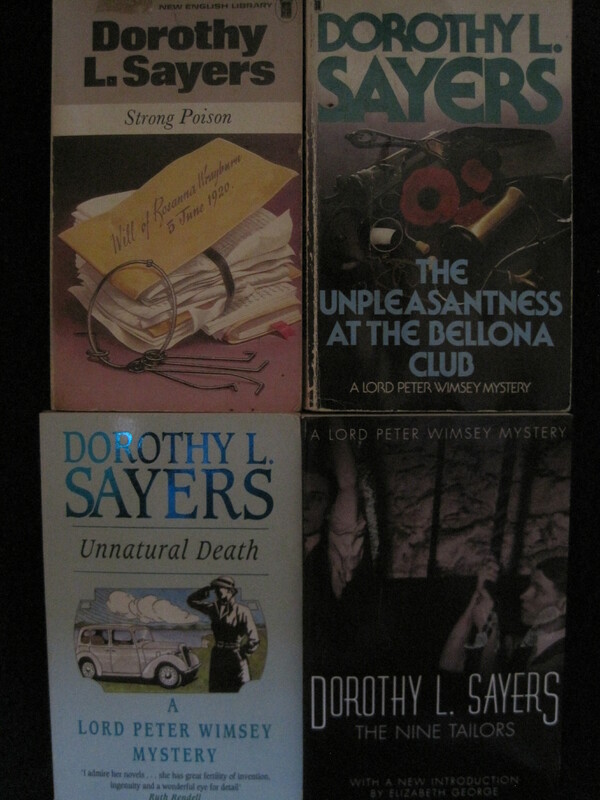 I hope that if you’ve read this far and you haven’t ever read any of Lord Peter Wimsey mysteries, you might be tempted to go and try one. My recommendation as a starting point would be Strong Poison or Murder Must Advertise, although equally Nine Tailors or even the very first book Whose Body? would be a good introduction. Don’t start with Busman’s Honeymoon (I’m not even linking to it to deter you further) as you’ll regret it if you don’t read Peter and Harriet for the first time in the order in which they were intended – I know I do and as soon as I had finished Gaudy Night for the first time I went back and read all four again in the right order! As usual, my links are to Foyles – because I love them, their Foyalty points, their order in the morning and pick it up from a store in the afternoon feature (which even gives you discount) and I’ve found that for this sort of book (ie not a mass-market new release) they are often cheaper than the alternatives – but equally you can find Lord Peter in your high street bookshop, at major online booksellers and often in charity shops. They’re also widely held by libraries because they are, after all, classics of the genre. Go – discover Peter – and enjoy. It’s lovely to read a post from someone who clearly loves Lord Peter as much as I do! The Peter and Harriet quartet are among my very favourite books and I regularly re-read them. I think my copies are even more dog-earned and falling apart than some of yours because they’ve been so loved. Alys – I will confess that I have some (several) of these as ebooks now as well!